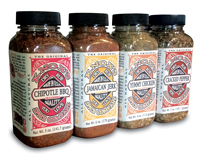 Knox's all natural dry rubs are authentic BBQ in a box created to make excellence easy. Regional flavors like Chipotle BBQ's flavor of the America's southwest or Carib-b-q blended for a distinct caribbean experience. Or seasonings just for chicken (Yummy Chicken) or beef (Cracked Pepper Rub). See our wholesale prices below. Great seasoning for grilled or steamed vegetables, salads, potatoes, sauces and soups. Our bright, unique package will attract your shoppers and our intense gourmet flavor and aroma will keep them coming back for more. Brighten your shelves or meat counter with Knox's dry rub seasonings and ignite a passion for all natural gourmet flavor. Download Knox's Spice Co Wholesale Price Sheet Here. Cracked Black Pepper, Garlic, Onion, Sea Salt and other quality herbs and spices are blended for a flavor and aroma that compliments beef. Add zest to your food by using our Cracked Pepper Dry Rub in place of your regular ground pepper. Add a gourmet flair to your salads, soups and dressings. 2" x 2" x 5"
Quality Jamaican Allspice, Thyme, Ginger, Black Pepper, Sea Salt and other herbs and spices blended in the tradition of Jamaica's multi cultural heritage. The aroma of Jamaica's finest Allspice balances perfectly with the heat of chilies creates the complex flavor and aroma we know as Jerk. 4oz shaker bottle. All the flavors that make chicken yummy, that's why we call it "Yummy Chicken". A perfect poultry blend of herbs and spices. Aromatic Thyme, savory, rosemary, basil and sage. The savory flavors of garlic, onion and the slight bite of cracked black pepper. Yummmy! Also an excellent table blend for salad and even potatoes. An excellent blend of Chipotle and Guajillo peppers , smoked Paprika, Brown Sugar, Garlic, Sea Salt and other quality herbs and spices. Our Chipotle BBQ has a rich depth of flavor that is naturally smoky, sweet and tangy. A perfect BBQ blend for any time of the year.